We need to track what is happening to our environment – and we can help when we are out and about or watching from our windows. Elmton and Creswell Wildlife Group invites you to record your observations of birds, mammals, insects, amphibians or plants, for example, on the form ECWG Table and email to ecwildlifegroup@gmail.com. Every year, these will be transferred to National wildlife records. 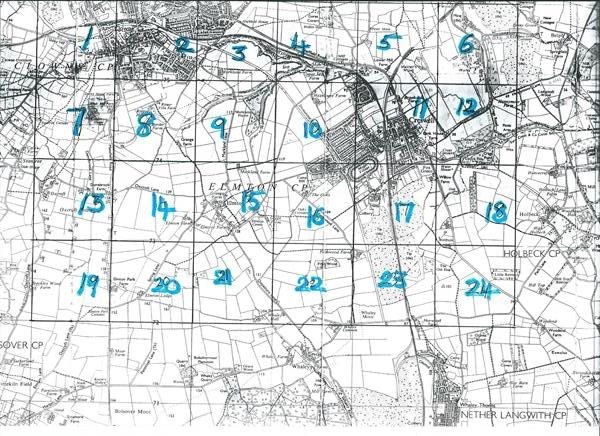 Please scroll to the bottom of the page to see the map of the region with the numbered squares so that you can provide the precise location of each observation. The map can also be downloaded by clicking on Map Numbered Squares for a larger version. Have you visited Poulter Park lately? It’s full of cowslips right now – so go and walk up the hill, visit the new sculptures and wonder at the cowslips. November 26th 2015: Please take a look at the wonderful site of the Sorby Breck Bird Ringing Group to learn more about birds in the wider area, and look at the amazing photographs.